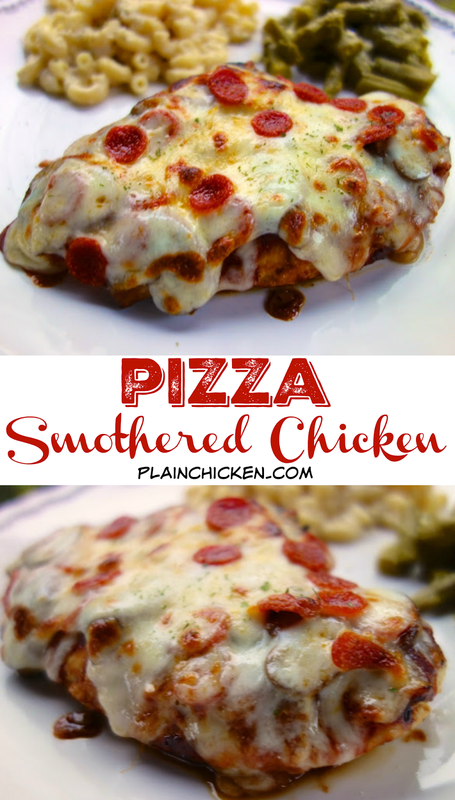 Pizza Smothered Chicken - your two favorite foods in one easy dinner! 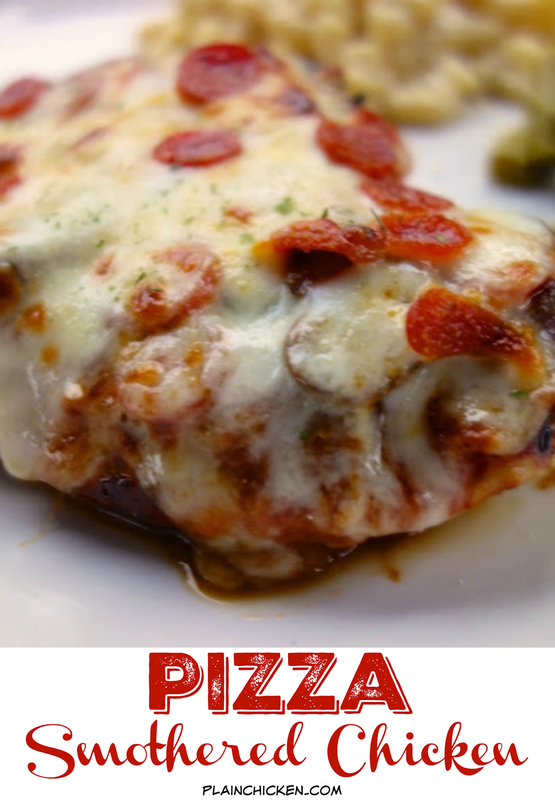 Italian marinated chicken pan seared, topped with pizza sauce, mozzarella and pizza toppings. Only 5 ingredients!! SO good! Everyone gobbled this up!! A new easy weeknight favorite! This chicken is SO GOOD! It is one of the top 10 things we've ever made. 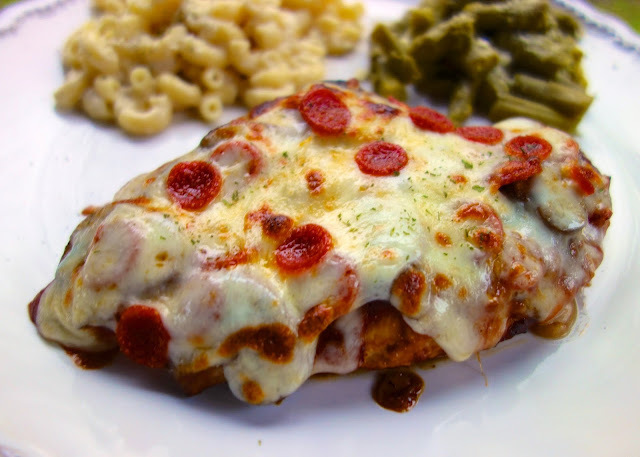 This dish truly combines my two favorite foods - pizza and chicken. I like to refer to this as "heaven on a plate"! Chicken Legs took one bite and said "Wow! This is good!". He wolfed his piece down and was hoping there was another piece for him to eat. There wasn't. I had to guard my piece from him and promised to make an extra piece next time. We are actually planning on making it again this weekend. This is seriously delicious! Marinate chicken in Italian dressing for 1 hour up to overnight. Remove chicken from marinade and grill or pan sear chicken until done. Approximately 12-14 minutes. Preheat broiler. Place chicken on rimmed baking sheet. 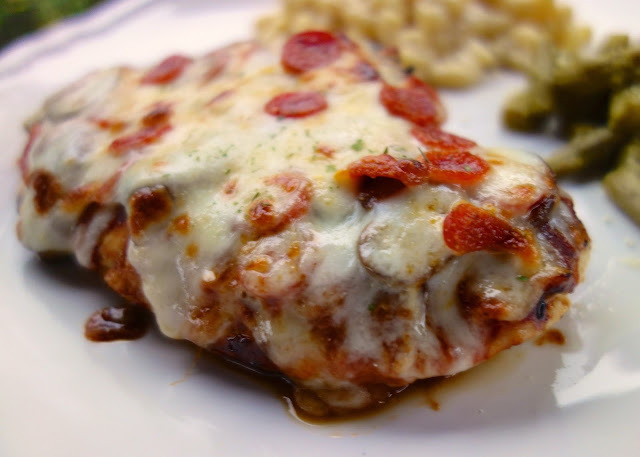 Spread 2 Tablespoons of pizza sauce on top of each chicken breast. Top with pizza toppings. Sprinkle mozzarella over toppings. Place chicken under broiler until cheese is melted and bubbly. That looks delicious, and perfect for my low-carb lifestyle. Thanks! I love chicken recipes, and always looking for new ones! Sharing on Google+ and Pinterest. Pizza and a chicken dish together...doesn't get much better than that! Top 10?? It must be delicious. I will try it soon. I'm planning on making something just like this, this week. I like the idea of the Italian dressing. Did the chicken struggle a lot while you held the pizza over his little beak? ha ha just kidding :) This looks great, Steph. Like Chicken parmesan on flavor steroids! I'm dying to make this recipe. On my low carb diet this satisfies even my pizza cravings. My only problem is that I am unable to grill where I live and would like to make this is the oven. I'm thinking 350 degrees for 25-30 minutes? Please give me assistance on making this. I LOVE YOUR SITE AND WOULD LIKE TO MAKE THIS FOR COMPANY THIS WEEK.....PLEASE REPLY! I would pan sear the chicken on both sides for 3 minutes and then finish it off in the oven at 425 degrees for 10 minutes. It will help with the cooking process if you pound the chicken to an even thickness - place it between plastic wrap and use a flat meat mallet to pound out the hump.